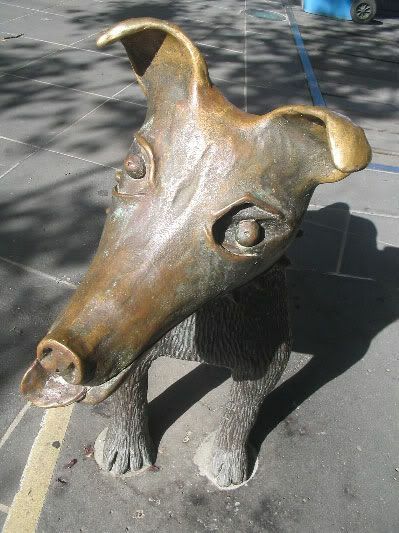 "Larry La Trobe" is the name of this cast bronze dog statue. 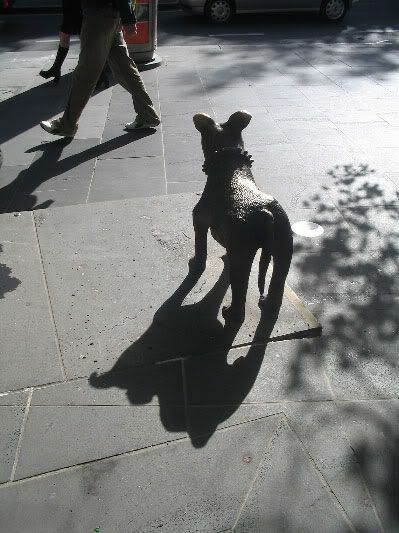 (it seems Melburnians are a bit keen on dog sculptures, in general.) It was made by Pamela Irving in 1992, under commission by the MCC like a lot of the other stuff put in around the place at that time. It's about 70cm high, and very securely bolted to the pavement. This statue is a minor Melbourne celebrity. Technically the statue in the photos is a copy of the original, which in a low comedy echo of the Weeping Woman affair, was stolen from its location (I seem to remember it was nearer to Swanston Street originally) in 1995, and never recovered. Local newspapers and radio set up an enormous "chase for Skase" style carry-on, and at last the MCC entered a 4m high float based on the statue in 1996's Moomba parade, but even this failed to stir any pangs of remorse in the thieves. When the statue still hadn't turned up a year later, Melbourne gallery owner and all-round rich person Peter Kolliner paid for a new one to be made and installed. Larry La Trobe is not a sculpture I like very much. It is a bit cartoony and cariacaturish and cute for my taste; and to my eyes the wide barrel chest and studded collar make it look a bit like a pit bull terrier. It's nicely made, but it doesn't present any sort of challenge to the senses or the imagination, and with things like this the spectator can only get out of them as much as he or she is invited to put in. I do like that it's made of bronze, though, rather than some less traditional and permanent material. It's obvious from the polished surfaces of the head and muzzle that the statue comes in for a lot of patting and stroking. If "small and quirky" was the only kind of public art the authorities saw fit to buy for us, I'd be unhappy, but I can live with one or two bits. All part of the rich tapestry, etc. As this is Statuary Friday #12, next week's post will be #13. 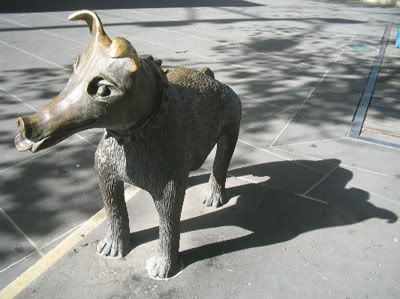 I am kind of superstitious about thirteen - in a be respectful-of-the-Force kind of way - so for next week I'm planning a special bumper edition about Melbourne's Unluckiest Public Sculpture. Hope you can make it! Here's a tip, anyone who doesn't like dogs is not worth knowing. Watch out. But this isn't a dog, it's a joke. An insult. A travesty. The fool who did this has never loved a dog. Too stupid. This isn't a dog, it's a nothing. A cross between a pig and an anteater. Take a drive to Farfield. There is a dog there. A large dog at that, made out of wood, with eyes that light up, and a tail that moves. 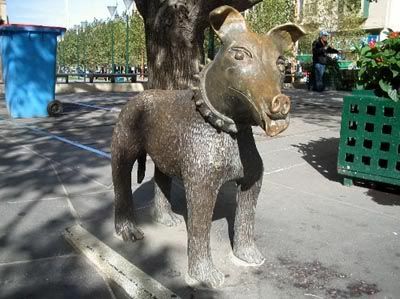 Fido is meant to be a tourist attraction, but he really is just a big waste of money. Meanwhile, the big balls at Northland have been taken away I saw today. They are installing a playground instead. Anna me darlin', been there, and done that! It does appear a bit much on the small, quirky, and cute scale. But you know I'll be here next Friday. "Melbourne's Unluckiest," huh? Can't wait to find out what it is. I was in Melbourne on the weekend and we drove past that dog. It looked rather small from a distance - but we thought it looked like a staffy, which is our kind of dog. I thought of you whenever I saw some sculpture! While I do agree it's cutesy and quirky, I think it's a joy to find something like this on the often dreary city streets. Yes, it's not challenging, but it makes me smile, so thumbs up to Larry. Plus the fact that it looks like a staffy is a bonus, so it's doing my little black Beeble dog proud! I love Larry! He is cute and quirky, and that is his charm! Not all statues have to be sombre or significant art. The thing I love most about Larry is he comes up in so many photos- people love having a few drinks and getting their photo taken with him. See it all the time! He inspires good old fashioned Aussie larrikinism- and I like it!